As a precursor to possibly going full-time in the future, my wife and I are planning for long-term (perhaps 6 months) trip around Europe. We're already fairly experienced motorhomers, having had vans since 2004, including visits to Europe most years - although none longer than 3 weeks. We have also some experience of living on the continent in our pre-motorhome days as we've done stints living in Belgium and Germany. We've got a month or two to get some stuff sorted out in the UK (my wife has already left her job and I've only got a week or so to do) and part of that will including preparing the motorhome - and the first, and biggest question, relates to that. We've currently got an Autoroller 600G, on a twin-wheel 2.4TDi Transit, which we've owned since new in 2010. On the face of it that seems a decent option as it's has a 3850kg chassis with a good payload and has a big garage (we'll take a small motorbike with us). storage stuff e.g. changing the overcab bed to storage, some shelfing in the garage etc. I'm just wondering if it's worth doing those changes to a 2010 van, or if I'm better either replacing it now or just doing a minimum set of changes for the 6 month trip. 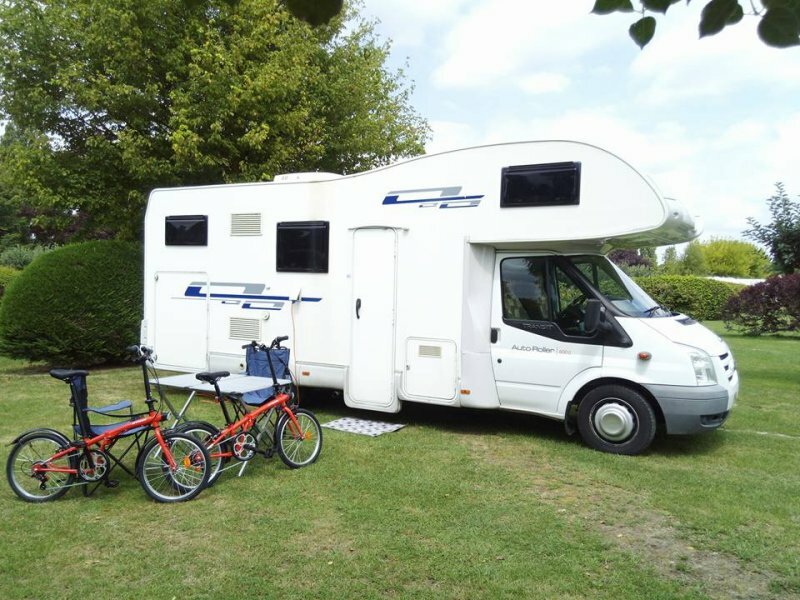 Barring the motorhome stuff I know we need to sort out insurance and have seen advice to use Comfort for that (we'll still have our UK address). What else should I be thinking about? Haven't given a lot of thought to route yet but heading up to the North Cape then down to either Gibraltar or Sicily as a sort of end-to-end could be fun. If that's North Cape, Norway that's a lorra, lorra miles! Even for 6 months. Well, at my rate it would be! I'd be inclined to stick with the MH you have - the month or 2 you have before going is not a lot of time to be sourcing a new van, with all the other things you'll have to be doing. And it might turn out to be less convenient than the one you have. I also wouldn't want to be adding a lot of extras if there's a possibility of changing in the near future - unless the upgrades could be transferred. replacing the current mattress with a better one (memory foam maybe) - I believe memory foam can be hot? solar panel additional leisure battery - depends on what type of travelling you intend. If off-grid then I'd definitely go down this route; if on sites, no need really. satellite system - is that just for TV? My husband and I travelled for more than 2yrs with no TV, never got bored. Only you can answer if you need it. changes to gas setup for European use - I'd definitely go for a refillable gas system, but with the filler outside, not inside the garage. You can take this with you if you change vans. storage stuff e.g. changing the overcab bed to storage, some shelfing in the garage etc. - Your MH is about the same size as ours was at the time so I wouldn't imagine you'd need more storage; we'd no overcab so you've that extra space for bedding, clothes, whatever. I believe some even put bikes up there! I hang things from hooks and eyes in the garage and use a few stackable boxes - I imagine that's more flexible than fixed shelving. Having said that, my present Hymer has shallow shelving to the front of the garage and it holds an amazing amount of bits n pieces. You also have to take account of the fact that every addition eats into your payload. If you haven't already, take it to a weighbridge; don't ever rely on the official figures. Our van had been plated at 3.85T but was upgraded to 4.2 because we sailed too close to the max. We had to fit airride suspension for that. That's something you'd need to look into early as it can't be done overnight. After all that, go for it!! What an exciting venture! Pudsey_Bear and dghr272 like this. I agree with all of Jiwawa's answers. We found we off loaded "stuff" every time we came home. The only thing we found we lacked were English language books. Well there is Kindle for that these days. Bedding was washed and dried in one day so no need even for a change of bedding, same with towels etc. This was either outside in the lovely sunshine or, if necessary, in a launderette. Drying laundry is the one hassle of life on the road but you work it out as you go along. Leave heavy stuff at home Rohan do a great range in lightweight travel clothing. By the way did you really join MHF in MAy 2005 and this is your first post, or is this a VS hiccup? Last edited by Pudsey_Bear; 09-07-2018 at 08:45. If like us we had know destination planned and it was just where we ended up, don't fall into the trap we fell into not sticking to EU countries as these are the only ones on your insurance.. We had to buy temporary insurance at various borders to be allowed in with the van, all at a premium they all seem to have a short fat bloke sweating profusely as resident insurance broker, don't pay what they want haggle em down... Make sure you add any non EU countries you might go to on your insurance.. If you want to actually see the countries you are going through, do not use toll roads. We went to 22 countries and never paid a penny in tolls, it saved a fortune. We only went into a couple of camp sites and only if something had dropped off or broke on the van, we wild camped all the time, we met loads of fellow wild campers in every country, you find they are really a community and you bump into them again and again as you wander along..
Any opportunity to fill up with agua take it, most is not potable but is fine for washing etc, we only drank bottled water I:E beer and wine, and if desperate water from a supermarket..
Lots of things you have to learn, but it's all part of the adventure. All the add on suggestions are good but the sat dish might only work when under the Sky umbrella. i.e. not that far from UK. Unless you get a international sat tuner and enjoy foreign programs. Better the devil you know I reckon rather than changing your MH now. Personally I would take a change of bedding and towels as it might not be convenient to wash them when you want to change them plus the weather might not be conducive to drying the articles. Extra battery and solar panel - yes - useful for wilding or Aires or even campsites with no EHU! Satellite system - ours worked as far south as Bordeaux and as far east as Koln. Useful for getting news updates but tbh probably more cost effective if you sort out decent wifi (or mifi perhaps?) if all you want is news. I always buy cheap DVD's off Ebay to take with us and then flog them on Ebay when we get home. I know some folks download onto 'things' but we are not techie enough for that (and neither are our TV/DVD players either I suspect!). Get an ACSI card and books. Get a Campercontact/All the Aires book too with loads of Aires/Sostas/Stelplatz etc in them. This year I have also started keeping a daily diary when we are on our trips too. I wish I had done it when we started MHing but better late than never. It will make interesting reading when we are in our dotage! Carry a spare habitation water pump - £50 on Ebay if its the standard Shurflow jobbie. Its a DIY job to swap it over if yours breaks and will save a whole world of pain too! Are you taking the motorbike in the garage, a rear mounted rack or a trailer? Is it a new addition or do you already take it with you? Only reason I ask is you need to be sure you have enough available payload to take it. Not many vans do. I wouldnt be without ours though. Why change to diesel heating? Ive never understood the appeal to be honest. refillable gas is dirt cheap in a Motorhome, much cheaper than diesel anyway. So Gaslow or similar is a must in Europe if your long terming. the only other must have is Solar. We have a satellite dome but its been on the van nearly ten years. I wouldnt buy one now as the UK Channels footprint is much smaller in Europe now. On a long trip you could well find yourself out of the range of it for much of it. I take a laptop with hundreds of series, films etc that I download to a vast library when I am at home. From experience......do take a spare Shurflo water pump. We had just arrived in France, Bank Holiday Friday....pump was pouring from a leak....every place shut for the duration....just turned round and made for home .....never again! We found our Nationwide credit card (no overseas charges) worked in even the most remote garages. When we first began travelling (not so savvy) a local very kindly used his card and we gave him the Euros. Pop into the local villages for supermarket priced fuel. France is great for the signs major roads indicating nearest fuel availability. As it's a Ford it may be worth investing in some security too, Have a look on youtube for security solutions.